On a hot summer afternoon in front of two hundred thousand screaming fans stood one of the most unique jam band front men in all of music history. To his right and to his left were speaker systems bigger than any middle class American home and music was thundering across a New York cow field. The crowd was a hodgepodge of young and middle-aged rockers who had traveled from all parts of the US to celebrate the 30th anniversary of the 1969 Woodstock music festival. For this band’s final song, the lead singer mounted a low-lying speaker at the front of the stage and sang one of the most passionate covers of Bob Dylan’s famous “All Along the Watchtower.” The set concluded with a frenzied roar and thunderous applause. A thousand miles away, I gazed at our computer watching my hero at the time, Dave Matthews, being crowned with rock star fame. The year was 1999. It was the year I first desired to do something extraordinary, something adventurous with my life just like Dave. Here at the height of an epic rock star adventure, Dave was impacting thousands of lives. I had to be like Dave. I grew up about a 25- minute ride from the St Louis Arch. My Dad was a small-town boy from Illinois, who had moved to Missouri to accomplish his dream of designing airplanes with Boeing. My mother had moved all around the US before her family finally settled in St Louis when her father got a steady job. I am the second oldest of four children. My sister, Mary, is one year older and my sister Ellen is about 5 years younger. The baby of the family is Michael who is 9 ½ years younger. As a boy I loved to ride bikes, play basketball, and ride any type of roller coaster. Rollercoaster theme parks were always a staple of our family summer vacations. The Catholic faith was always a key part of our family life. We would pray every morning together before breakfast and every night we would end with a family prayer on our knees, usually the rosary. 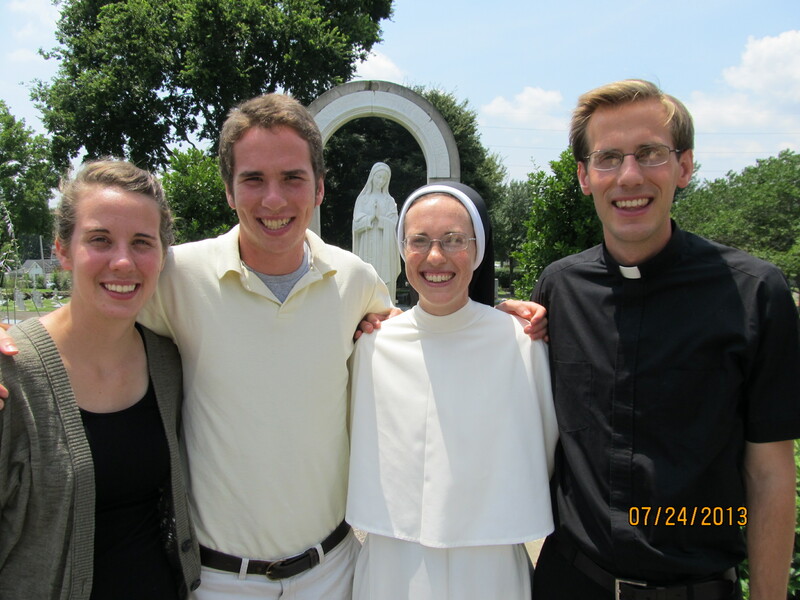 Summer became a special moment of family catechesis for us. It was in these summer months that Mom would periodically take us to Adoration on Friday nights, although sometimes she would have to take me kicking and screaming from my friends in the neighborhood. She would also give us a weekly allowance only if we completed 5 chores every day. “Make your bed and brush your teeth” was always the first chore and “Bible study with mom,” was always the last chore. During her daily Bible studies she would teach us about Scripture from a Scripture commentary she had bought. I would pretend to fall asleep sometimes in an effort to make her shorten the lessons but it didn’t usually work. I was a fairly good athlete through middle and high school playing sports like soccer, football, and baseball but it wasn’t until sophomore year that I found my real passion. When Santa Claus brought me a red imitation Stratocaster for Christmas I never put it down. The first song I tackled on that red Strat was the solo from Johnny B Goode by Chuck Berry. After that I moved on to learn all my favorite Eric Clapton and Dave Matthews songs. There weren’t enough hours in the day to rock out in my room. I’d stand on my little amplifier, about the size of a microwave, and practice jumping off it like I was Jimmy Page from Led Zeppelin. By a stroke of luck I was invited to play with a group of upperclassmen at my high school. 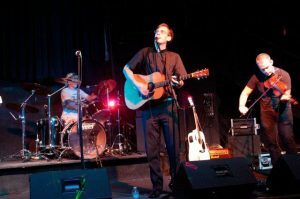 Our first gig was playing all the warm-up music for the home games of the varsity basketball team. Later, our band branched out and got to play at school dances and local restaurants. We’d play anything from Lynyrd Skynyrd’s “Free Bird,” to Styx’s “Come Sail Away,” to Billy Joel’s “Piano Man.” It was a rush for me each time we played. I loved the loud music, the sound of the crowd, and the adventure of getting to play at different places. My high school years were filled with many great memories, such as late night bonfires with friends, Friday night football games, spontaneous music jam sessions, two very memorable years in the high school musical, and many intense moments of high school basketball. I decided to enter college as an engineering major since it was seemingly more practical than a music major. However, my heart was still in music and my daydreams often found their way back to that video of Dave on stage at Woodstock ’99. In those summer nights before college I made a commitment to myself that I was never going to settle for a 9-5 office job. I was rather going to have an adventure with my life just like Dave had had an adventure with his. In my second year of college, my band, The Dance Commanders, caught a lucky break. Our lead singer, Nick, was good friends with one of the Sigma Epsilon fraternity guys who was organizing the big yearly frat party at the huge Sig Ep house, called the Party Barn. Nick did some sweet talking and got us in the band line-up. Hearing the news I was extremely excited and nervous. This party was going to be one of the first stepping stones on my adventure to follow in Dave’s footsteps. On the night of the party, the place was packed and we followed a not-so-popular screamo band of 4 bare-chested long-haired rockers. They were not very talented and it was all the better for us because the crowd at this point was really in the mood for some good music. We climbed on stage and started the show with a roaring rock tune and the crowd loved it. During my favorite song, 99 Red Balloons (the Goldfinger version) I got to jump off my guitar amp and slide across the stage in my salmon-pink wool pants and tie-dye shirt. No higher in campus fame had the Dance Commanders ever been as we were that night at the Party Barn. My ears were still ringing as I walked back to my dorm that night after the party. When the initial excitement and thrill of the night had subsided and the crowd had faded away, I began to feel very dissatisfied with the whole affair. It really had been fun to rock the Sig Ep house, but it also had been so superficial. The people there were just shadows of themselves. I remember thinking, “That was great but it wasn’t as great as I thought it would be. Now what?” This experience put a crack in my picture-perfect dream of rock stardom. Maybe the real and satisfying life of adventure actually lay down another path? Did I have the answer to these questions at that time? No, but these questions were enough for God to start to work in my life. My major in college had been electrical engineering so my time was taken up with lots of math and science courses. Upon conclusion of my second year of college it became very clear to me that I didn’t want to pursue a career in electrical engineering. That left me with a hard decision to make and I ended up moving from Missouri to Nashville, Tennessee to pursue a degree in music production. It was a tough transition for me because I left many of my best friends behind. Nervous about the new transition, I began to return to regular Eucharistic Adoration. It was here in Adoration that I would later receive an invitation to the greatest adventure of all time. Nashville was full of Protestants and in a very short time I found myself close friends with so many of them. The experience that I had attending their Bible studies and playing music at their services, while still attending Mass on weekends, profoundly impacted me. They had a more sincere love for Christ than I did, as well as a tremendous courage when it came to living out their faith in public. I began to write and play Christian music with some Baptist friends I had made and even went on a little music tour in Nashville and in Mississippi. However, the more exposure I had to playing music, even in Christian shows, the more I still felt something missing. I was doing what I loved to do, playing music, and I was surrounded by great people, but why was I still so anxious? What was wrong with me? One night I was feeling very restless and I drove about 45min to a lake where I used to mountain bike with my friends. I walked down to the lakeshore in the dark and sat on the rocks by the water and as I gazed up I was particularly struck by the beauty of the stars in the sky. That night the stars seemed infinite and breathtakingly beautiful. At this moment, overwhelmed by God’s beauty through the stars, I felt so compelled to trust Him and to surrender myself totally to Him and His plans for my life. I told God that night “Lord, I don’t understand myself. I feel so lost, yet I thought I was doing what I was made to do. Take control of my life now. You are in charge. I am ready to listen to your plan for me now. I am tired of following my own plans. If your path for me is even half as beautiful as the stars tonight then I want to follow it. Lead me. I am finally listening.” I left the lake that night with a deep peace knowing that I no longer had to figure everything out but that my life was now in God’s hands. I didn’t yet know what was going to happen, but I did know that God was in charge and that He wouldn’t let me down. In the next months a number of things came to light that were clear signs of God’s Providence orienting me in a surprising and unexpected direction. At one of the college youth nights, I was participating in an icebreaker game in which you walk around and write little affirmations on papers stuck to the backs of the people in the room. After the game I took the paper off my back and began to read the different comments people had written. One in particular struck me. It read, “John, you are a man for others.” I am not sure why that phrase jumped out at me, but it did, and it remained in my heart in a profound way. A number of months later I was watching TV as an interviewer asked the pope, “Pope John Paul, to you, what is a priest?” The Pope looked straight into the camera, as if looking at me, and said, “A priest is a man for others.” I was stunned. A grace came upon me at that moment and it became very clear in my mind that God had made me, since the beginning of time to be… that’s right… a priest. It had been true. I was made for an adventure, just not the adventure I had first thought. It was not Dave whom I was meant to follow, but Jesus Christ. His is the adventure that satisfies! In September of 2006, at the age of 21, I made the biggest and most adventurous leap of faith in my life. I left everything behind, changed my life plans and entered the seminary for the Legion of Christ. Every day has been a new challenge, a new grace, and a new adventure. I no longer live for myself but for Christ and that is the greatest thrill and adventure. He has filled my heart in a way that is indescribable and he has given so much purpose to my life. 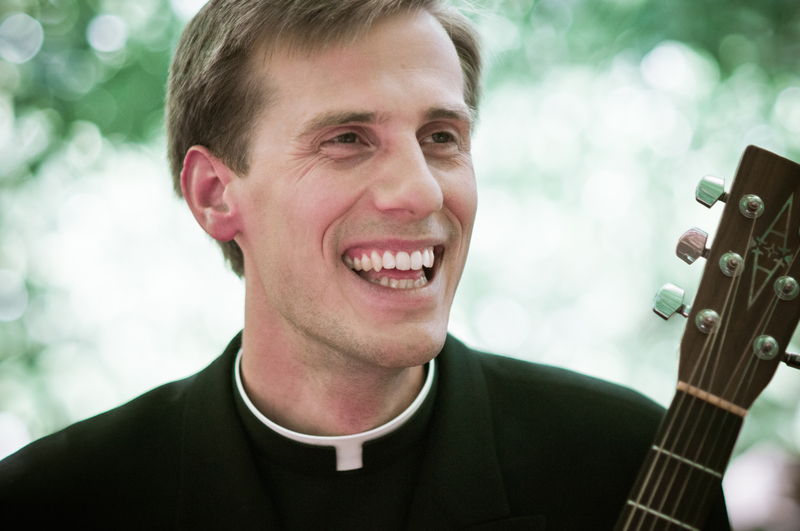 And, believe it or not, since entering the seminary I have gotten to play more music for more people than ever before! I have been able to play at countless youth retreats in Connecticut, Atlanta, Chicago, New York City, Rome and more. Christ even gave me a couple of “Dave Matthew’s moments” when I was able to play some of my own songs in REAL Madrid’s Santiago Bernabeu stadium for World Youth Day 2011 in Spain, and on a stage in downtown Krakow for WYD 2017 in Poland. I have already had more adventures than a life could hold! Christ did make me for a great adventure. Not for Dave’s adventure but for His! I wouldn’t change that now for the world! 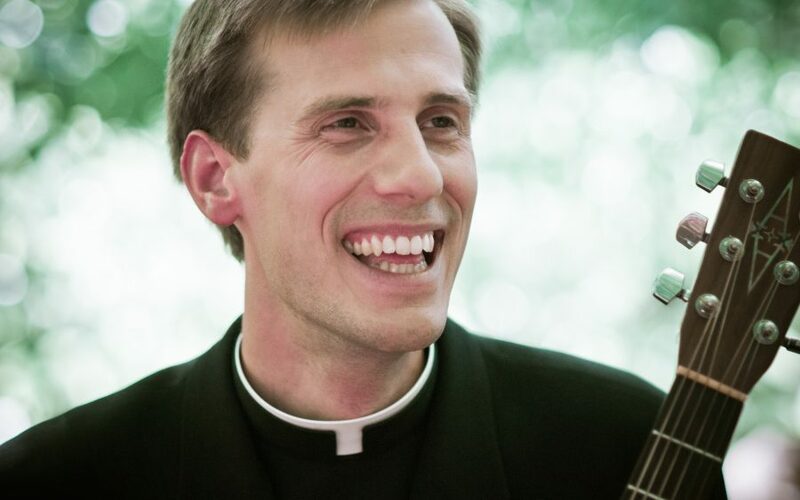 Br John Klein, LC was born in St Louis, Missouri on February 24, 1985. He has an older sister, Sr Mary Gianna, who is a Nashville Dominican, a younger sister Ellen, and a younger brother, Michael. He attended grade school at St Clement Rome and high school at Kennedy Catholic High school, both in St Louis. After two year of Pre-Engineering at Truman State he transferred to Middle Tennessee State near Nashville to study music production. 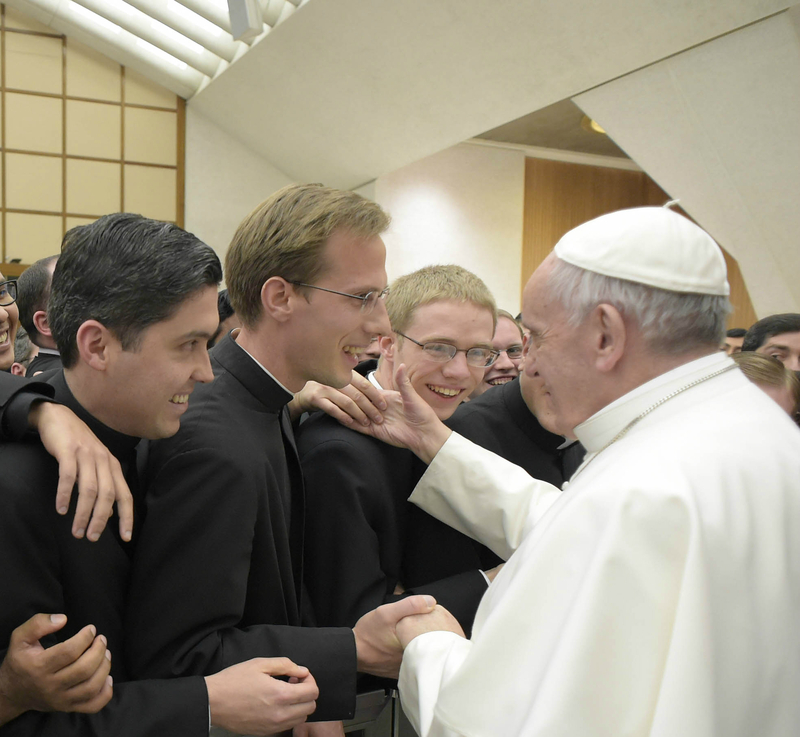 At 21 years old, he left college to enter the Legion of Christ. Br John did his novitiate in Cheshire Connecticut, his philosophy in Thornwood, New York and concluded his theology with three years of studies at Regina Apostolorum in Rome, Italy. He serves by helping with youth work in the same city where he completed his pastoral internship as a seminarian, Atlanta. He continues to write and play music as part of his ministry and has recorded two CD’s.